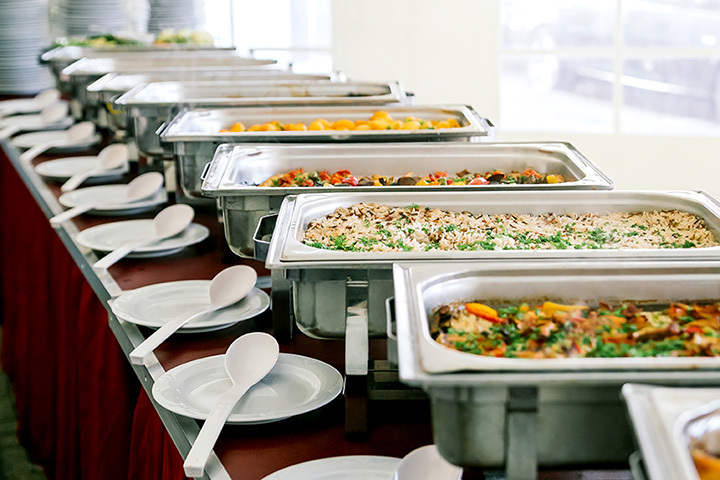 Whether you’re out with friends and the group can’t agree on dinner plans or if you just want to taste a little bit of everything, buffets make for a great solution. Kansas’ expansive buffet options range from American comfort food to Italian feasts. Whatever it is you like, you’ll find it at the best buffets in the state. Caesar’s Table in Wichita, Kansas, offers a huge buffet of American-style comfort food every day for lunch. Their downtown location in an unassuming office building is easy to miss, but their wide assortment of delicious dishes will keep you coming back. Choose from three buffet price options with different dishes included depending on price. Cinzetti’s in Overland Park, Kansas, is an “all-you-can-eat Italian feast.” The buffet includes over 60 dishes, including pizza, pasta, and salad. China Pavilion in Topeka, Kansas, features all your favorite Chinese food dishes on an all you can eat buffet. Choose between dine-in options, carryout, or eat as much as you like with the buffet. Joy Wok in Overland Park has over 150 items on their all-you-can-eat lunch and dinner buffet. Choose from hibachi, salad, sushi, crab legs, oysters, and much more for one low price. Pizza West was founded in 2010 by two brothers who “wanted to create a fun and friendly environment.” Pizza West has a consistently delicious lunch and dinner buffet, along with sit-down menu options. The Rajmahal Indian Restaurant provides Olathe, Kansas, with upper-scale Indian cuisine available as sit-down entrees and a buffet. The service, too, is exceptional. The Longhouse Buffet isn’t just a buffet—it’s an experience. Part of the Prairie Band Casino and Resort, the Longhouse Buffet is worth a trip by itself for the spacious seating, fireplace ambiance, and delectable buffet options including crab legs and prime rib. Hu Hot Mongolian Grill has five locations throughout Kansas, including one in Lawrence, Manhattan, Shawnee, Topeka, and Wichita. Create thousands of combinations from 60 unique ingredients on this unlimited Mongolian buffet. Sushi Modo offers all-you-can-eat made-to-order sushi. While you could order out, it’s much more fun to come in and order as much as you can. Try appetizers, sushi rolls, and more.